According to the people who wrote its script, bad timing proved to be the undoing of the second Transformers movie. When Transformers: Revenge of the Fallen came out in 2009, it didn't exactly win over the critics. In fact, they blasted it with such choice phrases as, "a horrible experience of unbearable length," and "simply despicable." Even director Michael Bay said that it was "crap," and in a roundtable discussion with The Hollywood Reporter, writers Ehren Kruger and Roberts Orci explained exactly what went wrong. According to the writing duo, it wasn't one thing that went wrong, but a series of problems and quirks that chained into each other. As they related back in 2009 at the BotCon convention, the script for the movie was written in a big hurry after the WGA writers' strike in 2007 - 2008. That wouldn't have been a problem for some movies, but for an effects-heavy movie like Revenge of the Fallen, work has to begin months before shooting starts in order to have everything ready. That wouldn't have been a problem either as the movie could have been put on hold, but Bay didn't want to wait, and so took an expanded version of the treatment that had been created before the strike started, and used that as his guide. "The movie could have been pushed," said Orci. "But [Bay] uses all the same people over and over. He considers himself kind of a jobs program. And for him the idea of pushing the movie means all these people that rely on him go down and they're in between jobs, etc." "[It] would have been considered a first draft outline," Kruger said. "And then suddenly you're locked into some of those things. And at that point it becomes very difficult - and very expensive - to try to rework macro ideas. Added to which, he was a bit cross about us going on strike in the first place!" Kruger continued, saying that the strike put both Bay and the movie in a rather untenable position. He said that the movie ended up being a collection of spectacles with the narrative connecting them as well as it could. It's worth mentioning, however, that as much as critics might have hated the movie, it still made a boatload of cash. It made back its $200 million budget in just five days, and went on to make hundreds of millions of dollars more, both domestically and internationally. 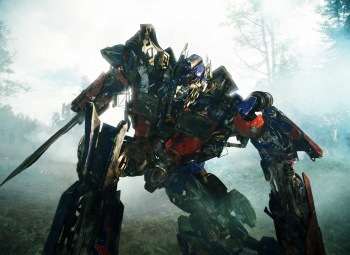 Hopefully, Transformers: Dark of the Moon, which hits theaters on July 1st, will be just as successful, without sucking quite so hard.